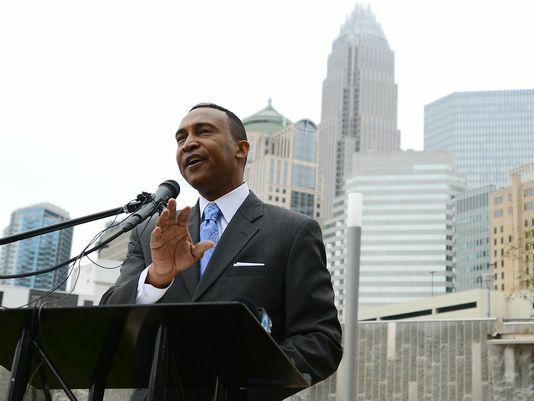 Patrick Cannon, the mayor of Charlotte, North Carolina, has resigned on Wednesday night after only 114 days in office. Patrick Cannon, 47, was arrested on federal corruption charges that allege he accepted tens of thousands of dollars from undercover agents, at least once in the mayor’s office itself. “I regret that I have to take this action, but I believe that it is in the best interest of the City for me to do so,” Patrick Cannon, a longtime Democratic member of the City Council who was inaugurated as mayor in December, said in a letter to the city manager and the city attorney. Mayor Pro Tem Michael Barnes, a five-term Democratic member of the City Council, immediately becomes mayor of a booming city that’s bigger than Boston, Atlanta, Washington, D.C., and Denver. Patrick Cannon was released on $25,000 bond pending his indictment Wednesday at a brief hearing before US Magistrate Judge David Keesler in Charlotte. He wouldn’t comment as he left the courthouse Wednesday. If convicted of all three counts of theft and bribery, wire fraud, and extortion, Patrick Cannon could face as long as 50 years in federal prison and fines up to $1.5 million, the US attorney’s office said in a statement. In an affidavit attached to a 46-page criminal complaint, the FBI disclosed that it began investigating Patrick Cannon in August 2010, when he was a member of the City Council and Charlotte’s mayor pro tem. Over the next three-plus years, the FBI alleges, Patrick Cannon solicited and accepted bribes of about $48,000 in cash and other assets – including airline tickets, a hotel room and use of a luxury apartment – from undercover agents posing as commercial real estate developers and investors. The “businessmen” wanted favors from city zoning, planning and permitting officials – who are highly influential in Charlotte, one of the South’s biggest business and commercial centers. At least once, Patrick Cannon accepted a large cash bribe in the mayor’s office itself, when he took $20,000 in cash in a leather Fossil briefcase on February 21, according to the affidavit. In one of their meetings, Patrick Cannon told an undercover agent a few days before he attended a meeting of new mayors with President Barack Obama in December that “I’m still in play” and offered to raise the agent’s purported concern over an extension of a transit line with Obama, according to the FBI.